Earlier this year, the CDC reported that the opioid epidemic is claiming the lives of 115 Americans every day. The forces of evil behind this unprecedented public health emergency are far bigger than a single drug dealer on a street corner. The drug cartels, running their business like any other billion-dollar corporation, are using every tool at their disposal to proliferate the heroin epidemic, including the internet. Law enforcement plays a complex role in combating this crisis that is pivotal to America winning the war on opioid trafficking and abuse. 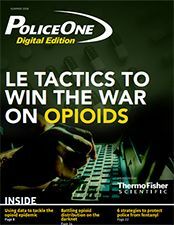 This digital edition explores the scope of the epidemic by looking at the evolving tactics of law enforcement response to the crisis. View as Digital Edition Click this icon to view an online-optimized version of the Guide. We recommend saving the link if you plan on accessing it later or via a different device.